In 1958 a first american lunar plan was approved, which envisaged five ARPA (Advanced Research Project Agency) coordinated missions: three managed by USAF (United States Air Force) and two managed by the US Army. The USAF probes were to be lunar orbiters. The USAF probe was built on a structure consisting of two squat glass fiber cones joined at their base by a cylinder and topped by a separable cluster of eight small vernier rockets and by a solid propellant, 13.3 kN thrust rocket based on the Falcon air to air missile. The Falcon rocket was to be used to slow the probe until it entered lunar orbit. The probes had a height of 45 cm, a diameter of 72.5 cm and weighted 38 kg. The scientific payload weighted 18 kg and included: a simple camera in which an oscillating mirror scanned the Moon sending its image to an infrared lead sulfide photodiode, a radiation counter, a simple search coil magnetometer and a microphone as a micrometeorite detector. Thermal control was enabled by covering the surface with a series of removable black and white stripes to control its temperature. According to flight plan 60 hours after lift-off the Falcon retro rocket was to be ignited and the probe to be inserted into an erratic orbit around the moon. The lifetime of the batteries was two weeks. The launcher was to be a Thor-DM18 Able-1, which consisted of a Thor first stage and the second and third stages of the Vanguard launch vehicle, which could send 39 kg to the Moon. The first of three probes was launched on 17 August 1958, but failed after only 77 seconds, when the Thor engine seized. 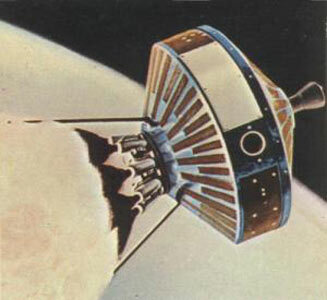 The probe did not receive a name and is generally refered to as Pioneer-0 or Able-1. Before the launch of the second probe, the whole program was transferred to NASA, with the USAF and the Army acting as simple consultants. NASA gave the probes the name Pioneer. On 11 October 1958, just ten days after NASAs foundation, the second probe Pioneer-1 (or Able-2) was launched. The second stage was shut down too early, leaving Pioneer 1 with a lack of speed to fulfill its mission. It was hoped, that firing the Falcon motor would put the probe into a earth orbit, but the ignition failed due to too low temperatures of the batteries. Pioneer-1 flew up to a height of 113854 km, less than a third of the distance of the Moon and fell back, disintegrating in the atmosphere after a 43 hours, 17 seconds flight. The mission was a failure, but the probe transmitted interesting data on the Van Allen belts, measuring their extension, on micrometeorites registering only 0.0052 impacts per second per square meter of sensor. Pioneer-2, or Able-3 was launched on 8 November 1958. It was very similar, but it had some important modifications: the NOTS (Naval Ordnance Test Station) infrared camera was replaced by a lighter, visible light camera built by STL (Space Technology Laboratories), which offered also a better resolution. Its place was moved from the waist to the lower cone. A cosmic ray counter was added and the batteries were replaced with a new model due to the problems on Pioneer 1. The Thor Able launcher received some modifications to the staging system and a new system of integrating accelerometers. The launch was alsthough ill-fated with the third stage failing to ignite. Pioneer-2 burned over Africa after a 45 minutes parabolic flight during which it reached 1.600 km into space.